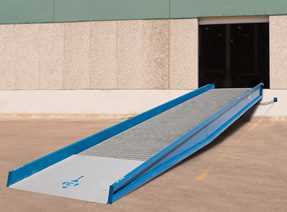 Loading Dock Ramps, or as they are sometimes referred Industrial Yard Ramps, are used for an extremely simple ground to dock height loading or unloading scenario. With lengths up to 50 feet the degree of incline / decline can be minimized. CSI provides loading dock ramps for customers who typically need to unload equipment away from the dock door.